The personality of the cat is a fascinating mixture of affection, domesticity and active independence. You may think you know your cat as he purrs in your lap, but come across your pet in the street on a dark night and you might think that Bagpuss suffers from a dual personality. Every single feline pet carries an inheritance of amazing sensory capacities, vocal utterances, The personality of the cat is a fascinating mixture of affection, domesticity and active independence. You may think you know your cat as he purrs in your lap, but come across your pet in the street on a dark night and you might think that Bagpuss suffers from a dual personality. Every single feline pet carries an inheritance of amazing sensory capacities, vocal utterances, body language and territorial displays. By answering such questions as 'what does a cat signal with its ears? 'why does a cat rub up against your leg?' and 'why does a cat swing its head from side to side when staring at its prey? ', Desmond Morris decodes the private world of the cat. To ask other readers questions about Catwatching, please sign up. the more you pay attention to your cat, the more you learn. ? does the book contain a cartoon about the infamous Wimbledon formation spraying team..? As a cat lover and owner, I have several books in my library devoted to either the care of these enigmatic animals, to their history and distributions in the world. Desmond Morris is a noted anthropologist, who has penned this neat little book devoted to the life and behaviors of the domesticated cat. He has answered many questions which are common and some one may not have thought about. For example:Why does a cat trample on your lap with its front paws? Why does a cat wag its tail? Why does a c As a cat lover and owner, I have several books in my library devoted to either the care of these enigmatic animals, to their history and distributions in the world. 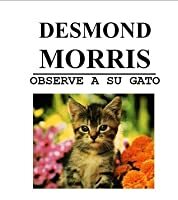 Desmond Morris is a noted anthropologist, who has penned this neat little book devoted to the life and behaviors of the domesticated cat. He has answered many questions which are common and some one may not have thought about. Why does a cat roll over to lie on its back when greeting you? Why does a cat chatter its teeth when it sees a bird through a window? Why do we say "He let the cat out of the bag!"? It was a good introduction to cats but as a long time cat lover most of the facts in the book I already knew. I had hoped for something a little more academic or something that went into greater depth on the social interactions of those colonies of semi-feral cats. 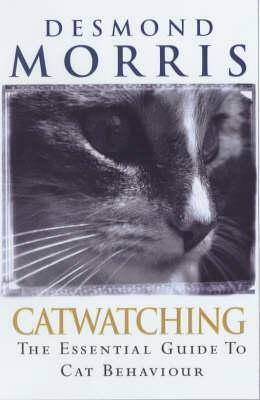 I know Morris has taken part in those studies but Catwatching doesn't touch on it (except briefly in the introduction). The illustrations though are wonderful. i am not joking when i tell you this was one of the most interesting, fun, and compulsively readable books i have ever purchased on a whim from Goodwill. packed with information, observations, and strange little asides, i completely devoured this book. no joke. dead serious. i know you probably think this is one of those fake reviews people do like where they go on Amazon and claim a gallon of milk saved their marriage, but no. i am totally serious. this book was weirdly awesome. After dipping in a couple of times my eyes were tired from rolling - SO anachronistic (scientists cannot allow possibility of animals experiencing feelings or reason), dripping in condescension (for cats and the reader), and far too smugly self-amused (bad jokes). However, I read the whole thing, and while all of the above is also true, I did learn a couple of things (Hairless Sphynx cats are from CANADA? wtf?! What kind of maladapted accident is THAT? ), and there were a few cat funnies too that After dipping in a couple of times my eyes were tired from rolling - SO anachronistic (scientists cannot allow possibility of animals experiencing feelings or reason), dripping in condescension (for cats and the reader), and far too smugly self-amused (bad jokes). However, I read the whole thing, and while all of the above is also true, I did learn a couple of things (Hairless Sphynx cats are from CANADA? wtf?! What kind of maladapted accident is THAT? ), and there were a few cat funnies too that made me laugh. A short and surprisingly entertaining read. Kedilerinizin anlam veremediğiniz davranışlarını açıklığa kavuşturmak ve kedi aleminin mucizelerini öğrenmek için bu kitabı mutlaka okumalısınız. THis short book finally brought some peace to my chaotic household. We had two young cats (brothers) who, while lovable and entertaining, were completely out of control and not responding to any of the behavior modification tips I usually used with cats. After being disappointed by at least 5 other cat behavior books, I was skeptical about this one. Catwatching helped me understand that cats respond to positive reinforcement, punishment will only make them neurotic. Catch them doing the right thi THis short book finally brought some peace to my chaotic household. We had two young cats (brothers) who, while lovable and entertaining, were completely out of control and not responding to any of the behavior modification tips I usually used with cats. After being disappointed by at least 5 other cat behavior books, I was skeptical about this one. Catwatching helped me understand that cats respond to positive reinforcement, punishment will only make them neurotic. Catch them doing the right thing and praise, praise, praise! i.e. : anytime he uses the scratching post I say "Good kitty!" and use his name- they quickly learned that good things happen at the scratching post and use it more often. When they're climbing the curtains, distract them with a toy rather than punishing. You'll get farther. Don't' use a treat, that's rewarding bad behavior. I also learned cat body language that was very helpful, such as blowing a quick breath of air into the face of a cat who has gone crazy on your hand/feet/etc. Stops them immediately. Putting a few fingers not their forehead and pushing lightly says "enough of that". Following Morris' lead, I watched how they communicated with each other and followed suit. They were still hyperactive acrobats until they were for years old (and we had to cat-proof much of the house), but this book helped me immensely. Only one I found that has. trying to get in these mother fuckers' heads YA HEARD? Ich hätte gerne die Vorzüge dieses Buches gelobt, die dank der Beobachtungsgabe und der empirischen Denkweise des Autors durchaus zu finden sind. Gerne hätte ich meine Kritik darauf beschränkt, das der Autor die notwendige Bekämpfung von Mythen und Aberglauben rund um Katzen in diesem Buch manchmal etwas zu dogmatisch nimmt, z.B. wenn Feuer mit Feuer bekämpft und einem Vorurteil eine (meines Empfindens nach) schwach-populärwissenschaftliche These entgegengestellt wird (z.B. "Kleine Katzenspezies Ich hätte gerne die Vorzüge dieses Buches gelobt, die dank der Beobachtungsgabe und der empirischen Denkweise des Autors durchaus zu finden sind. Gerne hätte ich meine Kritik darauf beschränkt, das der Autor die notwendige Bekämpfung von Mythen und Aberglauben rund um Katzen in diesem Buch manchmal etwas zu dogmatisch nimmt, z.B. wenn Feuer mit Feuer bekämpft und einem Vorurteil eine (meines Empfindens nach) schwach-populärwissenschaftliche These entgegengestellt wird (z.B. "Kleine Katzenspezies X wurde 1971 in den USA entdeckt, weil dortige Teenager dazu neigten in kleine Appartmentwohnungen zu ziehen."). mein krasser Kritikpunkt: Desmond Morris befürwortet die genetische Herstellung von "Designerkatzen" in New York, die in allen Merkmalen den Wünschen ihrer Kunden entsprechen und Preise von ca 1800$ erzielen. Desweiteren führt er alle Kritik an dieser Katzenproduktion dem Neid der Besitzlosen zu. Ich kontere das mit einer ähnlich zugespitzten Aussage:" Tiere auf diese Art in Labors zu produzieren ist eine Form von Faschismus, die jedes Recht dieser Lebewesen auf ein natürliches Leben mit Füßen tritt. Hätte man Animal Farm gelesen wüsste man sowas." Coincido con maragota21 Es interesante, fácil de leer, pero quizas tenía más expecativas ya que Desmond Morris ha sido una eminencia en lo que se refiere a comportamiento tanto animal como humano. De todos modos no está mal. Indispensable para los amantes de los gatos. - Feces burying is the act of a subordinate cat, fearul of it's social standing. A study discovered that tom cats, far from burying their feces, actually placed them on little "advertising" hillocks. This slender book is a quick read, with plenty of "fun facts" about cats. The book was written way back in 1986, by a British author, so it doesn't completely resonate with an American cat owner in 2018. Desmond Morris seems to assume that all cats, including pet cats, spend time outdoors. He doesn't account for the strictly indoor cat. I don't know if that's a U.K. thing, or a 1986 thing, or both. He also mentions several times that a cat who is nine or ten years old is likely near the end of i This slender book is a quick read, with plenty of "fun facts" about cats. The book was written way back in 1986, by a British author, so it doesn't completely resonate with an American cat owner in 2018. Desmond Morris seems to assume that all cats, including pet cats, spend time outdoors. He doesn't account for the strictly indoor cat. I don't know if that's a U.K. thing, or a 1986 thing, or both. He also mentions several times that a cat who is nine or ten years old is likely near the end of its life, and indicates that the cat who advances to its late teens is exceptional. I have to wonder if some of the science is also dated, if there have been new discoveries or insights about feline behavior in the last 32 years that would contradict the material in this book. However, assuming that most of the material is still accurate, it's interesting to read about cats' body language, behavior, and physical abilities. Since I read Inside of a Dog: What Dogs See, Smell, and Know by Alexandra Horowitz I've been wanting to read a similar book about cats. This isn't quite what I was looking for, but I'm still glad I read it. All the essential questions about your cat's behavior are summarized in this excellent feline foray. I got it off the 10 cent rack at the local library near our home. It looked a little thin as it is laid out in a brief chapter format while answering all those pesky questions about the cat. For example: Why does a cat purr? Why does a cat chatter it's teeth when it sees a a bird through the window? Why is a female cat called a queen? Don't be fooled by the format, this is a worthwhile guide for All the essential questions about your cat's behavior are summarized in this excellent feline foray. I got it off the 10 cent rack at the local library near our home. It looked a little thin as it is laid out in a brief chapter format while answering all those pesky questions about the cat. For example: Why does a cat purr? Why does a cat chatter it's teeth when it sees a a bird through the window? Why is a female cat called a queen? Don't be fooled by the format, this is a worthwhile guide for the cat lover. http://www.desmond-morris.com/dm_art/ . This book demonstrates his incredible powers of observation. One factoid I can't resist is that a male feral cat has a territory of 150 to 175 acres. In city cat territorial terms, this area could support 12,500 cats! This book was great to learn more about the itsy-bitsy's of cat behaviour which, as a cat owning family, we thought we knew much but this book expanded our knowledge. Everything from why does it purr, why do they come to our laps, what's with the playing and flipping of the ball, why can they seem to be 'cruel' when they've caught prey, and to their courtship and (crazy) mating acts, the history of their domestication and lots, lots more. Just as we read books on people's body language, this is t This book was great to learn more about the itsy-bitsy's of cat behaviour which, as a cat owning family, we thought we knew much but this book expanded our knowledge. Just as we read books on people's body language, this is the book for cat's - I know treat and understand my cat much better. Recommended reading for those who own these feline animals! A hardback 'coffee-table' sized read of a book published by Edbury Press Ltd in 1994 which as far as I can ascertain is no longer in print though second-hand copies are available. As beautiful to look at as it is interesting to read, if ever there was a book guaranteed to have cat lovers swooning this is it. (just why are cats attracted to those who 'dislike' them? Do they have ESP and can they predic A hardback 'coffee-table' sized read of a book published by Edbury Press Ltd in 1994 which as far as I can ascertain is no longer in print though second-hand copies are available. As beautiful to look at as it is interesting to read, if ever there was a book guaranteed to have cat lovers swooning this is it. (just why are cats attracted to those who 'dislike' them? Do they have ESP and can they predict an earthquake? Why do we say its raining cats and dogs?) albeit sometimes a bit too simply - those wanting more in-depth explanations might be disappointed but for your average 'crazy cat person' and especially those wanting an introduction into feline behaviour this is purrfect. Como amante de los animales y, entre ellos, de los gatos, me entretuve mucho. Siempre es entretenido saber cosas nuevas, en especial cuando tienen base científica, y en especial cuando la base es legal y no extraída de cualquier lugar, que a veces es solo una mentirota publicitaria o puramente sensacionalista. Sin embargo, por eso mismo de ser un amante de los animales, la gran mayoría de las cosas ya las sabía. Disfruté, en todo caso, como siempre, la prosa de este señor, que escribe tan bien, d Como amante de los animales y, entre ellos, de los gatos, me entretuve mucho. Siempre es entretenido saber cosas nuevas, en especial cuando tienen base científica, y en especial cuando la base es legal y no extraída de cualquier lugar, que a veces es solo una mentirota publicitaria o puramente sensacionalista. One thing is for sure, I have never ever known this much about cats before. This book has taught me so many things about cats and has corrected many of the things I had thought about cats before I read this book. but it turns out it's because it "Signals a friendly social mood." Now I watch our cat in a whole different way. Now I watch her and I always know what she is doing and why she is doing it. It wasn't exactly a book you c One thing is for sure, I have never ever known this much about cats before. It wasn't exactly a book you could give five stars to I must admit. Not that I didn't absolutely like it but a five star book in my opinion has to be completely "amazing" all the way through. Many of the things about cats in this book were "amazing" but a few things were not. There's not much you can say about this book that the subtitle 'The Essential Guide to Cat Behaviour' doesn't tell you. It's a fascinating read for cat lovers. You may know some of the reasons behind some of your cat's behaviour. There's bound to be the answer to more than question you've had at the back of your mind for years though. I flew through this in a couple of hours. It's a pretty short book with no flannel. Just explanations for why cats do what they do. It's a pretty old book. So I'm un There's not much you can say about this book that the subtitle 'The Essential Guide to Cat Behaviour' doesn't tell you. It's a fascinating read for cat lovers. You may know some of the reasons behind some of your cat's behaviour. There's bound to be the answer to more than question you've had at the back of your mind for years though. It's a pretty old book. So I'm unsure as to whether it would still be seen as totally accurate. I'm sure some of what is given as explanation is opinion based on his long years of experience. Maybe views of parts of it have changed. This short and fairly interesting read is everything a (new) cat person should know about those magnificent creatures. It's a great entry-level guide through your favourite companion's behaviour. It does as it promises in the introduction, no more, no less. Although I was aware of most of the things presented in the book, new and exciting facts were plentiful. The only thing that bothered me is the fact that even though the author mentions giving cow milk to cats, he never actually warns the rea This short and fairly interesting read is everything a (new) cat person should know about those magnificent creatures. It's a great entry-level guide through your favourite companion's behaviour. It does as it promises in the introduction, no more, no less. Although I was aware of most of the things presented in the book, new and exciting facts were plentiful. The only thing that bothered me is the fact that even though the author mentions giving cow milk to cats, he never actually warns the reader of the potential damage it might do. Libro que encantará a todos los amantes de los gatos. En poco más de cien páginas, el zoólogo y etólogo Desmond Morris responde a las preguntas que siempre hemos podido hacernos sobre nuestras mascotas - ¿cuál es el significado del ronroneo?, ¿por qué tienen las pupilas en forma de raja?, ¿cómo afecta el celo a machos y hembras? - con un lenguaje que todos podemos entender, además de ilustrarnos con una magnífica introducción sobre el papel de nuestro querido amigo en la sociedad desde los albore Libro que encantará a todos los amantes de los gatos. En poco más de cien páginas, el zoólogo y etólogo Desmond Morris responde a las preguntas que siempre hemos podido hacernos sobre nuestras mascotas - ¿cuál es el significado del ronroneo?, ¿por qué tienen las pupilas en forma de raja?, ¿cómo afecta el celo a machos y hembras? - con un lenguaje que todos podemos entender, además de ilustrarnos con una magnífica introducción sobre el papel de nuestro querido amigo en la sociedad desde los albores del mundo. Sin duda alguna lo recomiendo: es un libro bonito y ameno que les dejará con muy buen sabor de boca.